The versatile Megastar is the superstar standard of straighteners, the best of the best. It's a game-changing styling tool that exemplifies our reputation for innovation, introducing an infrared strip shining through the plate. The Megastar introduced to the market an infrared strip that beams gentle yet powerful heat directly into the hair shaft to neutralize the positive ions in dry, damaged hair. More than just a straightener, it has beveled plates that offer infinite styling possibilities, from sleek, straight strands to bouncy curls, or beachy waves to saucy flips. And it boosts hair's health and shine to boot! The Megastar Hair Straightener is much more than a straightener. It conditions and softens with each pass, delivering an infusion of negative ions not only from the tourmaline ceramic plates but also from the negative ion light on the base for immediately noticeable shine and softness. 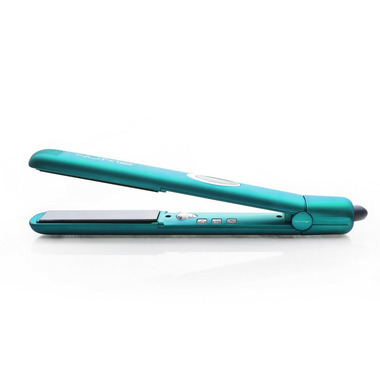 With a direct beam of infrared light sending gentle yet powerful heat directly into the hair shaft, the Megastar is the best hair straightener for creating stunning styles that gleam with health. Styling is faster and hair is visibly shinier. One pass and done. Straighten: Sleek looks have never been easier! Floating plates have a small suspension system that adjusts to compress your hair while styling, acting as a cushion. You'll notice a slight bounce when you press down on the plates - this is how they compensate and release pressure so every pass glides smoothly without tugging or pulling at your precious tresses. Curl: Flip and curl styles are a breeze thanks to the round-edged design and beveled plates that prevent bend and demarcation lines in your hair. 100% pure tourmaline ceramic plates means your styling tool will always heat evenly and deliver intensely conditioning results. 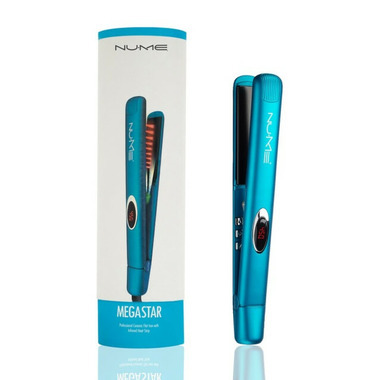 Unlike tools with plates that are only coated with tourmaline, your NuMe straightener will never lose its luster, and neither will your hair! Infrared technology allows heat wavelengths to penetrate directly into the hair shaft, which means less time spent on styling, less heat exposure and less damage. Our pure tourmaline ceramic styling tools are safe for all hair types and achieve gorgeous results, even on damaged, dyed, fine, medium or coarse hair. Very good straightener, heats up fast and turns off after an hour if you accidentally leave it on, like I do. So worth the price! I have hair that would never ever curl but with this straightener (I know, I know but trust me) I got curls that actually stayed!! It gets hot enough that my hair actually holds a curl - it's so amazing! It heats up super super fast. It's actually fun to watch the screen fly up to the temperature you want. Highly, highly recommend if you're looking for a high quality straighter that gets the job DONE! I am extremely impressed with this straightener. I have difficult to curl hair and this works amazingly and stays all day. It heats extremely fast and cools fast too! Heats up very fast and you can see the temperature on the display screen. Very nice quality. I use this straightener to both curl and straighten my hair. Love NuMe products!